There are Rockies and then there are Canadian Rockies! The town of Banff and the 3 nearby ski resorts are nestled in the heart of Banff National Park (a UNESCO World Heritage Site), and are among the most picturesque places to be found. You’ll get to join Toufic and Linda for one fantastic ski/board week in Canada at one of Banff’s premier hotels in the heart of town. 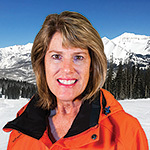 You’ll start every day with free breakfast; ski or board at your choice of three world class mountain resorts (all on one lift ticket with FREE shuttles to any mountain); and end your days with your fellow travelers at club-sponsored events, the hot tub, or at the many bars and restaurants nearby. In addition to our welcome reception, we will be having an Après ski or two, and a Farewell Banquet dinner. Additional activities available include tubing, snowshoeing, snowmobiling, dog sledding, ice walks and natural hot springs! The club gets discounted lift tickets and equipment rentals for this and all our trips. Plus, you’ll find body-friendly elevations: the town is at 4500 feet and the summits are 9000 ft. There’s plenty of vertical, but without high altitude issues. This is a special place where there are more mountains than million-dollar condos, where real people get treated like celebrities, and celebrities get treated like real people. When you get here, the lack of lift lines means your vacation is spent skiing, not waiting. That leaves plenty of time to enjoy the majestic peaks, remote woodlands, roaming wildlife, and fantastic snow. 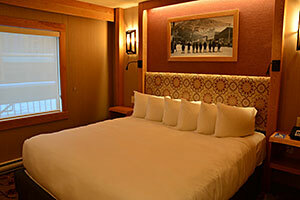 Plus, we’ll be staying in town within short walking distance of many restaurants and bars (there are over 130 in town). If you’ve traveled with Toufic and Linda before, you know how easy and fun it is to travel with us. 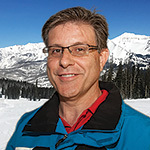 For more information on the ski areas, go to SkiBig3.com. 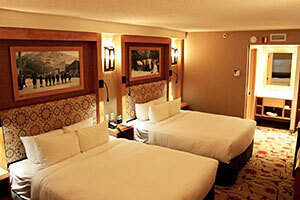 The Banff Ptarmigan Inn is centrally located in Banff National Park only steps away from the downtown area. 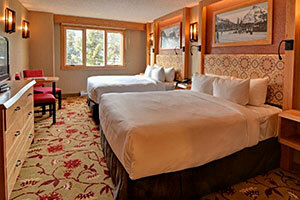 This mountain hotel is a great escape to the Canadian Rockies. On your vacation you can enjoy our mountain views, and numerous outdoor activities skiing, skating, and snowshoeing in the winter. The Standard Hotel Room features one king or two queen Mountain Luxury beds and a view of the atrium or lobby. The Superior Hotel Room features one king or two queen Mountain Luxury beds, and an exterior view, with some rooms having a balcony. 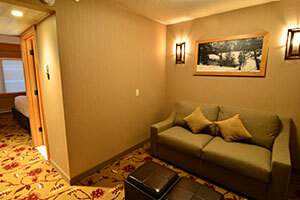 The Superior King Suite features one king Mountain Luxury bed and a sitting area separated by the bathroom. MT. Norquay is just minutes from Banff. This family-friendly mountain offers outstanding conditions for beginner, intermediate and advanced skiers and riders and it offers the only night skiing in the Banff-Lake Louise area, including a fully lit terrain park, and expert snowmaking on 85% of the terrain. Since opening in 1926, Mt. 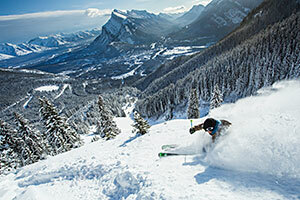 Norquay Ski Resort has been the locals’ gem. It’s also famous for being the training ground of Olympic and World Cup athletes. This is the best-kept secret in the Canadian Rockies! 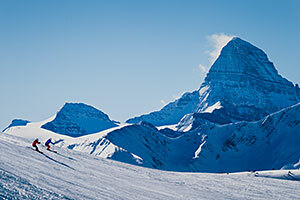 Lake Louise Ski Resort is known for its spectacular scenery and versatile terrain. With over 4,200 acres spread across four mountain faces, Lake Louise is also one of the largest ski resorts in North America. Just minutes from the village of Lake Louise, the ski area’s exceptional layout allows families and groups of all abilities to ski together with beginner, intermediate and expert runs from every chair. As well as receiving the #1 Ski Resort in Canada at the World Ski Awards, Lake Louise has also been awarded with the 2015 Visitors’ Choice Award for best terrain by readers of OnTheSnow.com. 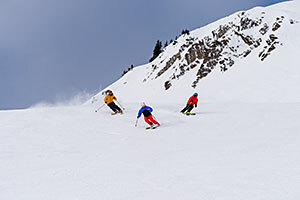 The Lake Louise Ski Resort offers a variety of terrain from gentle slopes and long cruising runs, to glades, chutes and some of the Canadian Rockies most exciting and wide-open bowls. Sunshine Village Ski Resort sits high on the Continental Divide in the heart of Banff National Park just 20 minutes from Banff. Three sprawling mountains provide breathtaking sight lines, uninterrupted by any signs of civilization. You can ski/board across the Continental Divide, and from Alberta to British Columbia and back. Sunshine can receive up to nine meters (30 feet) of snow in a season and the Village’s altitude of 7,200 feet ensures the snow stays light and dry. 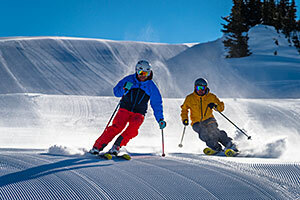 This world-renowned resort features more than 3,300 acres of skiable terrain, ranging from gentle beginner runs all the way up to extreme big mountain runs. Sunshine’s very own Delirium Dive has been named one of the 10 top off-piste destinations in the world. Sunshine Village also was awarded “Best View from the Best Off-Piste Run” by Ski Canada magazine. Resort Only: Deduct $555 per person if you choose to get your own air. Ground Transportation is not included for Resort Only travelers, but may be available if the traveler can meet the bus on time and space is available. Prices are per person. 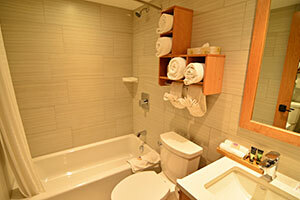 Accommodations are assigned in order deposits are received. No space is held without a $350.00 per person deposit. Early commitments get first choice! All prices reflect a cash discount. There is a convenience charge for credit card transactions. Round Trip Airfare from Tampa to Calgary, Transportation to Banff Ptarmigan Inn and back to the airport, 7 Nights Lodging, Daily Breakfast, Welcome Reception, Farewell Banquet, and Après Ski Activities. Plus, you get access to our discounted Lift Tickets and discounted Equipment Rentals. All cancellations must be received in writing by September 14, 2018. For cancellation policy, see the trip application. Payment of final balance is due no later than September 21, 2018. Don’t Wait! At this price, this trip will sell fast! Make checks payable to "Tampa Bay Snow Skiers & Boarders" (or TBSSB) and mail to: Toufic Moumne 9909 Woodbay Dr. Tampa, FL 33626.